For couples who want an awe-inspiring finale at their reception, there’s nothing more glamorous or breathtaking than a performance by a world class cirque act. High impact dance and acrobatic skills set amongst flames with unique props and incredible special effects to amaze your guests on your Big Day. Former Cirque du Soleil artists Dan and Stephanie have performed to royalty and audiences of thousands around the world, as well as on the BBC, ITV and MTV. 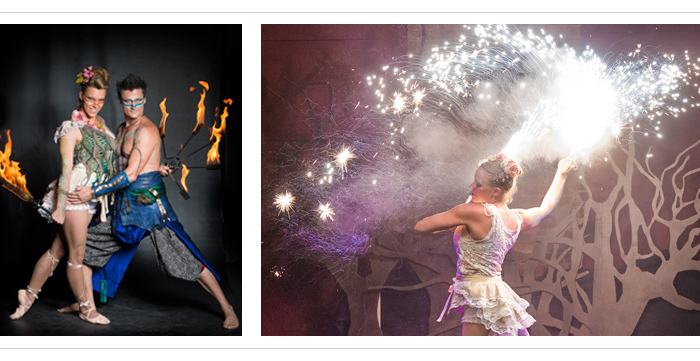 The dynamic duo now run Spark Fire Dance, providing extravagant fire artists and performances for luxury weddings and private events in the UK and beyond. An exhilarating mix of power, elegance and playfulness. Spark Fire Dance’s feature acts are an adrenaline-fueled display of fire stunts and acrobatics, with a spectacular pyrotechnic finale. Their atmospheric performance options involve ethereal creatures flitting from the shadows to delight and amuse guests. Exquisitely magical characters with graceful flames, handstands and dramatic sparks lighting the night sky. Dan and Stephanie start by deciding which performance type will best suit your event: High power choreographed stage acts with set soundtracks are a thrilling climax to an evenings entertainment. Atmospheric performances, beautiful for estate gardens and outdoor settings, work with your music to seamlessly slot into the wedding’s theme. Multiple appearances delighting guests over the course of the night. Who typically books Spark Fire Dance? Captains of industry, Hollywood stars and global corporations are frequent clients. Their event history reads like a who’s who of the world’s most recognisable people and brands, so it’s only fair to highlight that Spark Fire Dance perform strictly at high-end, opulent celebrations with a generous budget. For example, one wedding event involved being flown to the Maldives by seaplane, performing on an infinity pool as the sun set into the Indian Ocean behind them. Their act was followed by a set for the bride and groom by pop icon, Jennifer Lopez. That sounds amazing! Where can we see them in action? The website sparkfiredance.com has photos and footage of previous work including information on past clientele, locations and the calibre of performance they offer. To learn more or make an enquiry, email with your date, country, guest numbers and venue details.